If you have a ton of customer contacts from another app or platform that you would like to import into Setmore, you can do this easily using the Import Customer feature. Note that while we offer a direct import from Google Contacts, for most other platforms we recommend that you export your customer list as a .CSV file. This will make the import much smoother. Due to system limitations, you may only import a maximum of 500 customers at any one time. When uploading your spreadsheet, please make sure you have 500 or fewer entries or rows per file (but you may continue to upload multiple files as needed). 1. Navigate to the Customers tab and click the list icon (horizontal bars) at the top of the middle column. It's next to the "Add New Customer" (+) button. From the dropdown menu, select "Import customers." 2. You'll be prompted to choose between importing from Google or importing from a CSV file. If you choose Google, then you'll be prompted to sign into your Google account. 3. In this example we'll upload a CSV file. Select the file from your computer and click "Open." 4. The next step is the same for both CSV/Google options. 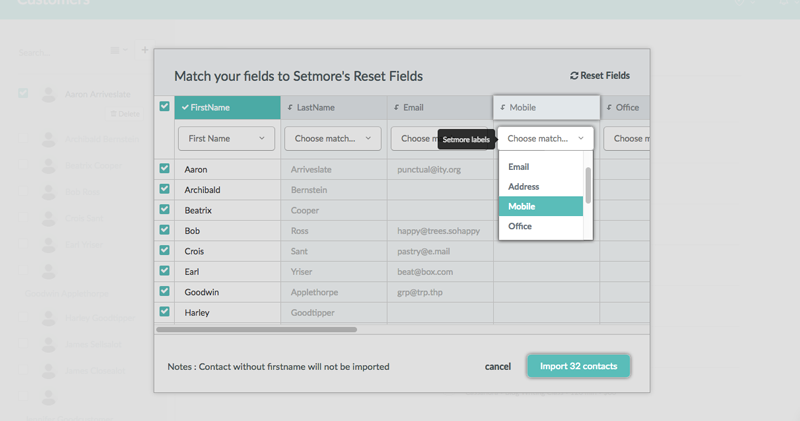 You'll be prompted to match the data fields from your prior contact list to the data fields within Setmore. Use the dropdown menus below each category to select a matching field. Note that for CSV files, the data fields are referenced from the header row of your data file. When everything looks good, click the "Import contacts" button. 5. A popup will appear to indicate that the import is underway. You'll receive an email notification once all customers are added. After you receive the email, refresh the browser window or log back into Setmore to see your updated contact list.